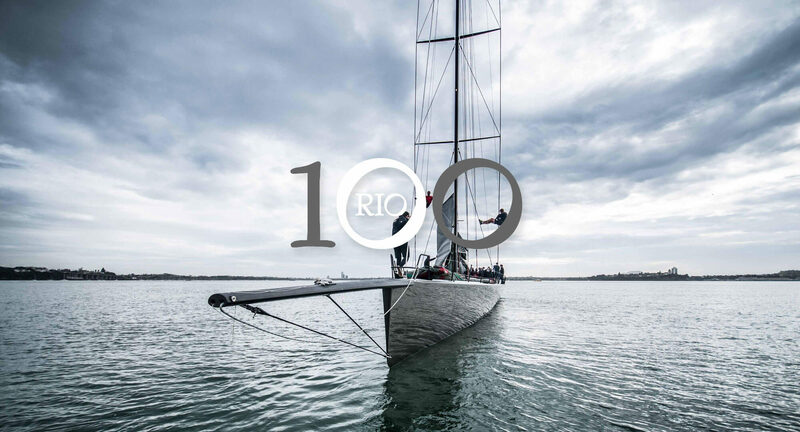 Manouch Moshayedi’s Rio 100 had her first taste of freedom this morning in Auckland, stretching her legs with her new Doyles inventory under the watchful eye of Boat Captain – Keith Kilpartrick. Once again, www.livesaildie.com was commissioned to capture her progress. Like the new sails, the sky was a silvery-grey with a moderate 10 knot northerly and showers rolling through on and off were doing their best to pester the camera man (me) – lucky cameras are weather sealed! The day started early for the crew, along with the desingers (Bakewell-White) and boat builders every one was on hand at 5.15am to incline test the boat before her maiden sail in new configuration. By 8.30 sails were loaded and Rio was backed out into the harbour. The new Doyle Sails NZ main went up and straight out of the box looked great. Mike Sanderson and Richard Bouzaid from Doyle Sails were on hand, keeping a watchful eye over their sails. There were smiles from Mike in the chase boat on the way home – I think every one was happy with how things had turned out. The boat is now back out of the water and has gone through its IRC measurements. The boat will remain out of the water for a month or so before being resplashed in preparation for the Maxi Challenge and Coastal Classic late October (race from Auckland to Russell, Bay of Islands). Check out the teaser vid above, and the photos below. We will have the full video (including her delivery from Cooksons to Gulf Harbour) up shortly!